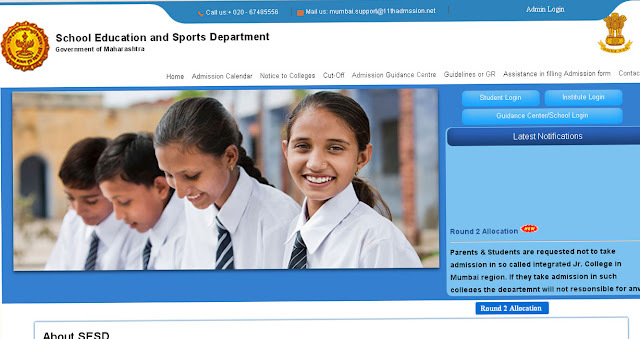 The SESD website - http://mumbai.11thadmission.net has declared Round 2 Allocation Merit list results 2017.Over 1 Lakh students have been waiting to get admissions based on the FYJC Second Allocation Merit List. The FYJC 2017 Round 2 Allocation Merit List for admissions in First Year Junior College (FYJC) is released on its official website mumbai.11thadmission.net. The School Education and Sports Department (SESD) of Govt of Maharashtra announced the FYJC 2017 Round 2 Allocation results for candidates seeking admissions to Std 11 under the First Year Junior College managed by Centralized Admission Process (CAP) Committee. How to Check FYJC 2017 Mumbai Second Allotment Merit List? You can download the FYJC result and take a print out for future use. You can also see a notification after the Round 2 Allocation results were declared on the SESD website. Candidates need to confirm their seat between July 21st to July 24th except Sunday. The vacant seats after Round 2 Allocation will be displayed on July 25th at 5pm. Student who want to exercise option for college and stream in Round 3 Allocation must do it between July 26th to July 27th 2017 till 5PM only. The FYJC.org.in Mumbai Third list of Round 3 Allocation will be released on July 29th.